Do you have Self-Storage needs in Arizona? Look no further because Storage Max is the key to your storage needs. At Storage Max we understand the various reasons for storing your valuables, so why not get the best? 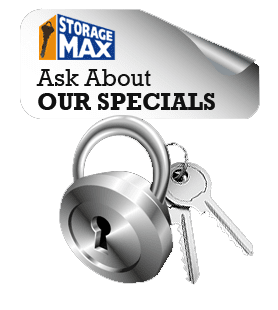 At Storage Max we want to offer you the best self-storage service in Arizona. Our friendly staff is dedicated to your self-storage satisfaction. 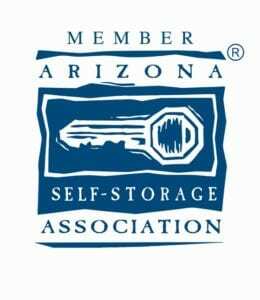 As a member of the Arizona Self-Storage Association, Storage Max functions on a higher standard of quality and professionalism. From Yuma to Scottsdale, Storage Max has convenient locations throughout Arizona to show that we are your best self-storage option. Some of our features include surveillance cameras and gated access to help ensure the security and privacy of your stored valuables; and facilities that are clean and well maintained. Whether it be a 5' x 5' space for some of your personal items or 10' x 40' for your larger household needs, Storage Max is your first and best choice when it comes to self-storage in Arizona. Fill out our Inquiry Form and find out about our Move-In Specials today! Scottsdale: Providing parking spaces ranging from 16ft to 50ft for storing boats, trucks, RVs, campers, and anything else on wheels. Please contact us today to learn more. At M&W Mini Storage, let us show you that we are your best choice for Self-Storage in the West Des Moines area. We function on a higher standard of Self-Storage quality and professionalism. Let us be your solution for your Self-Storage needs. Wouldn't you enjoy facilities that are clean and well maintained, a friendly staff dedicated to your Self-Storage needs; and even a convenient location in the West Des Moines area? Resolve your Self-Storage needs in West Des Moines, Iowa. Look no further because we are the key to your Self-Storage needs. Let us be your first and best choice when it comes to Self Storage in the West Des Moines area. Fill out our Inquiry Form and find out about our Move-In Specials today! Content copyright 2018.Saratoga Storage Systems, Inc.All rights reserved. Great and helpful! We have had an RV and have used storage there from time to time and had nothing but professional, helpful service. Thanks! The pricing and the choices make this a no-brainer to use. I have a 10x10 unit and it works perfectly. I had the option of rollup or a walk-in unit. No complaints with me on this. I was running a few minutes late and called Katherine to inform her. She stayed in the office until I arrived and even extended the gate hours for the first night to get moved in. Her customer service was excellent. StorageMax made my move easy and the staff was great! Thanks for everything. It’s a great place affordable clean and the staff is very helpful! Super Helpful And Nice People! Great place to do business. Highly recommended! Great deal and great customer service at the office. Nice friendly people that will explain everything in detail! I would refer them to anyone! Facility was clean and dry. Sign up was simple and the people were friendly, helpful, and terrific to work with. Painless!! Had to put some stuff in storage from my parents house. Great prices. Easy access. Great customer service. Awesome customer service. Very friendly workers. Awesome security and storages. Telling my friends to get one here. Great service. Very friendly. Awesome prices!